Are you reading this on a mobile device? The chance you’re is huge. Did you know that during the previous year Black Friday sales 40% of all the purchases were made via mobile devices? 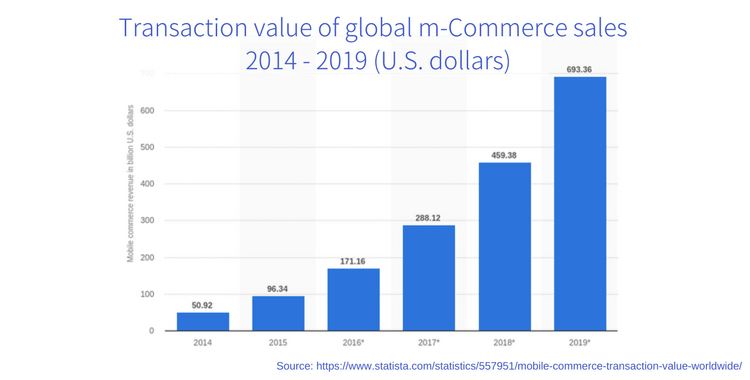 Because more than 1.2 million users access the Internet via mobile devices nowadays, the opportunities the mobile shopping opens are tremendous. Dealing with eCommerce nowadays you have no other choice but to cater for mobile users. If don’t - you just keep ignoring your potential customers. Which shopping cart will help you conquer “next-generation eCommerce”? At Cart2Cart we deal with 80+ eCommerce solutions daily and know each of them inside out. 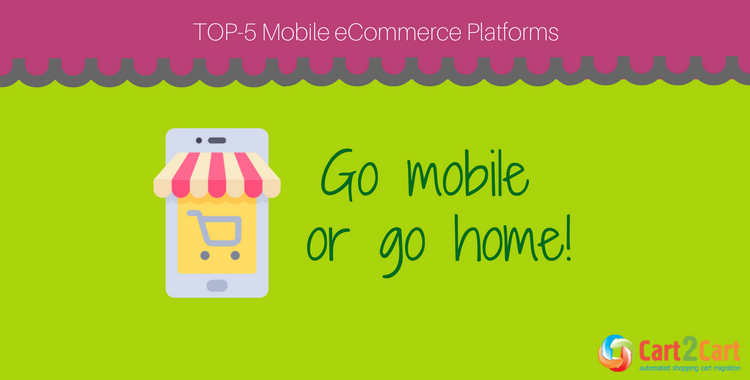 Below you’ll find Top-5 mobile eCommerce platforms to build online stores with responsive designs. Dreaming of the upturn in sales? Go for it! The math here is fair and simple. The latest numbers for Internet and mobile usage around the world say that out of 7.5 billion people 3,8 billion surf the Internet, 4,96 billion are unique mobile users and 51% of all the traffic comes from smartphones. Hence, once your online store is not optimized for mobile devices - HALF of your potential customers are lost at the very beginning of the customer journey. 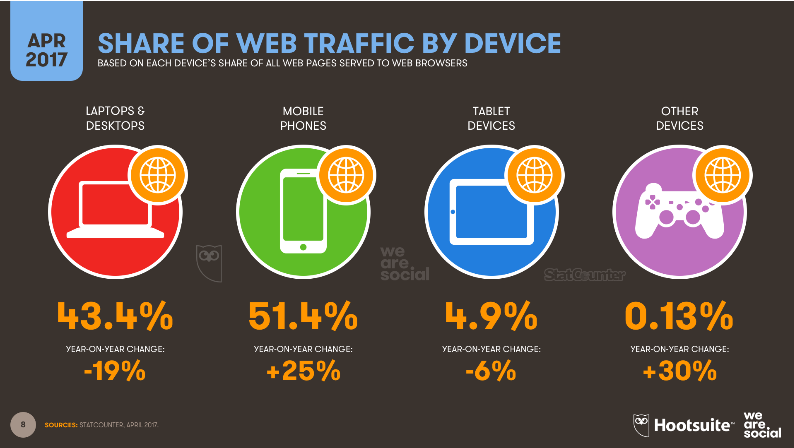 Check the latest data from Thenextweb illustrating that traffic from laptops and desktops has been decreasing in 19%. Note, the year-on-year change of the mobile traffic worldwide constitutes 25% (!) growth. Need more proof? How about these facts? Why is Website Responsiveness Even an Issue? Unfortunately, the majority of shopping carts were designed only with desktop browsing experience in mind. Once the platform of your e-store is one of them, you have to be ready to say “good-bye” to a fair deal of new sales. To ensure excellent customers experience and overdo the numerous competitors your e-store has to be accessible on whatever device your clients decide to use. As an option, you can always have a separate mobile site, yet nowadays it is the useless move and waste of resources. Choosing one of the following eCommerce solutions you’ll be able to pick up more sales for merely being available for visitors and returning customers. Because the focus of website optimization has shifted towards smartphones and tablets, select a shopping cart that will offer this feature out-of-the-box. Here are 5 best mobile eCommerce platforms that will help you build a responsive and customer-oriented store with the efficient user experience. As a true online commerce leader, Shopify empowers over 600,000 live stores worldwide and has all the necessary functionality allowing your clients tap their way through your storefront and find the necessary products from any device with ease. 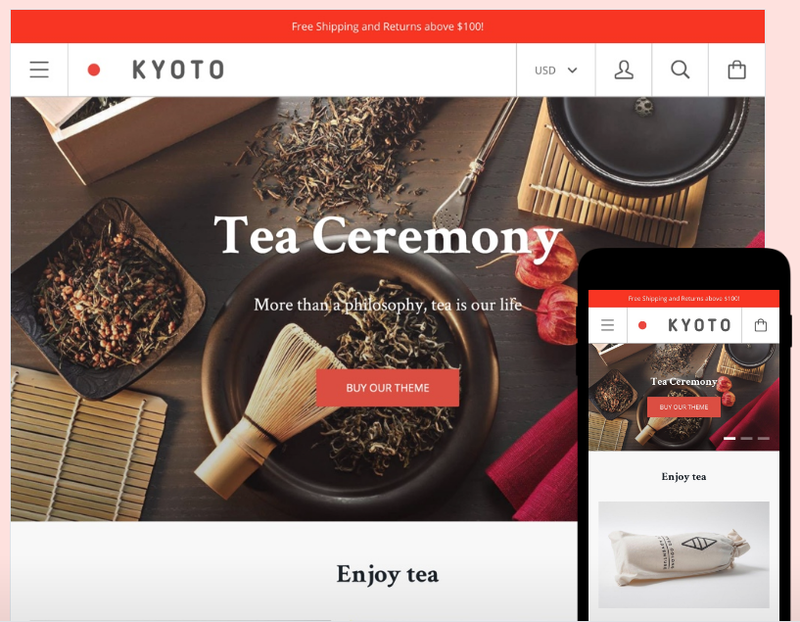 This ‘pure’ eCommerce builder was designed exclusively for selling online, including m-commerce with the highest levels of security. Shopify offers free, built-in mobile commerce functionality. Thus, your customers will be able to browse and find all the required goods via mobile phone. Using HTML 5, this eCommerce solution guarantees your e-shop will be compatible with iPhone, Blackberry, and Android. Shopify Themes include numerous customizable mobile website designs. Click here to check all the Shopify mobile ecommerce templates and check yourself that this is virtually the best mobile commerce platform. Find out how Shopify import will benefit your business. Magento, a world leader in digital commerce cloud innovation, will give unlimited opportunities for tech-savvy online retailers. The shopping cart is open-source with extended plug-in architecture. Once Magento is your destination, choose a template that is responsive and go ahead conquering m-commerce. Magento allows modifying the code the way you find necessary and extend your store with any custom features. The eCommerce solution is reshaping mobile shopping experiences by developing brand-new progressive web apps (PWAs) for Magento users. PWAs guarantee fast, frictionless, “app-like” experience generating more traffic, increasing conversions and faster page load time. Magento developers are well aware that traffic from smartphones will outbid the desktop by 2019 and are investing a lot into m-commerce functionality. Magento PWAs mix the best features of webpage and mobile applications to guarantee your store responsiveness and vast experience of the native app via constant gratification of a mobile browser, reducing the hassle of downloading and installing the app. Currently, Magento works towards replacing responsive websites with PWAs and deal with significant drawbacks a mobile-friendly site might have. Magento e-stores offer much faster, application-like customer experience with more seamless checkout processes and increased engagement with the help of opt-in push notifications for introducing discounts and product releases. Check how to perfrom Magento import in a couple of simple steps. Surprised? Please, don’t be as BigCommerce is currently one of the most rapidly developing platforms. This self-hosted software solution has hundreds of useful tools to grow customer base. BigCommerce will provide you with the robust eCommerce capabilities to succeed with your online store and achieve even the most challenging goals. BigCommerce will help you increase mobile sales with no additional effort as it offers a conversion-optimized mobile shopping cart out-of-the-box. Dozens of ecommerce templates are available at BigCommerce Theme Store. They automatically fit any screen size, compatible with Google Analytics and have great SEO capabilities. Official BigCommerce website claims that their fully responsive one-page checkout can boost conversion by up to 12%. This eCommerce solution also enables PayPal One Touch to offer single-click checkout to 170+ million PayPal buyers. Once you work on customization of any BigCommerce theme, you’ll be able to preview the changes you introduce on any device - smartphone, tablet or desktop before publishing the updates. BigCommerce import looks like a smart idea? Click for details. WooCommerce is a free plugin of the world-dominating content management system - WordPress. The eCommerce solution has all of the essential eCommerce features, including numerous product types, payment gateways, delivery settings, tax control, stock tracking, coupon system, discount coupons and many others. What might be its primary benefit? This platform is fully extendable both with WooCommerce child plugins and WordPress extensions and themes. WooCommerce has open-source architecture and enables you to view, modify and contribute to its code customizing your website to make it look and function as required. Choosing the elegant theme for a WooCommerce project is now easy with StoreFront. It develops professional-looking designs that will form a rock solid foundation for your online shop. 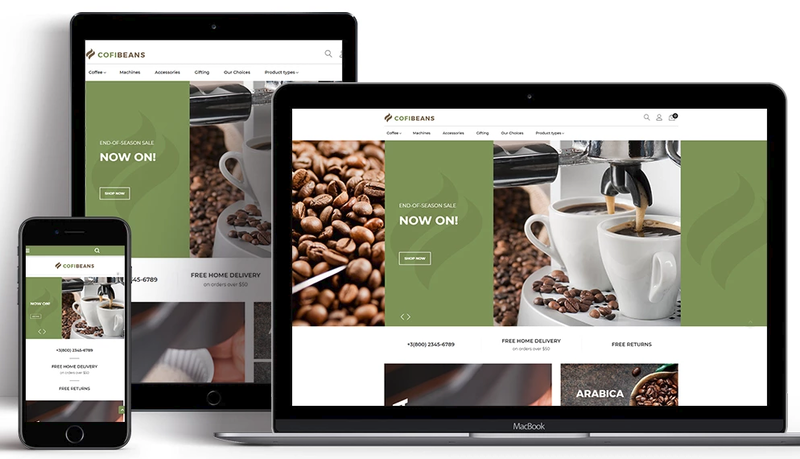 There are numerous responsive templates, both free and paid, that will look great on any device. You can click on any theme available and get demo preview on the gadget you are interested in. Explore the benefits of automated WooCommerce import via automated service. PrestaShop - an open-source e-Commerce solution with 500+ features built-in offers responsive front and back office. Key advantage - this shopping cart is free to download and use. The platform allows entrepreneurs to set a fully customizable, up-to-date store in couple of minutes, without any license fees or revenue percentages. PrestaShop Templates come with a built-in mobile-optimized shopping cart enabling your customers to browse and make purchases from any device they opt to use. The platform ensures quick and seamless mobile checkouts. Managing PrestaShop store on-the-go is an excellent opportunity to stay connected to your business outside the office. We know how to make your PrestaShop import efforless and the most accurate. The modern world is fast. Do you like its pace? I bet you do! Coping with several tasks simultaneously you can see, feel and get much more than people even a couple of years ago. Making an order while waiting for a business partner come to lunch or simply while commuting to work every morning is no longer something extraordinary. It is the absolute “must” to cope with the speed of life. Save your clients time, be accessible! You’ll enjoy business growth and positive feedback from the thankful buyers. Your current shopping platform is not in the list? Is this a problem? No. Migrating to another shopping platform is one of the necessary moves to keep your business up and running nowadays. Cart2Cart will guarantee swift and secure data import to any of the platforms you find appealing. We support migration to/from 80+ carts and have over 100,000 enhanced stores on our count. Try Free Demo to see how simply replatforming could be done!